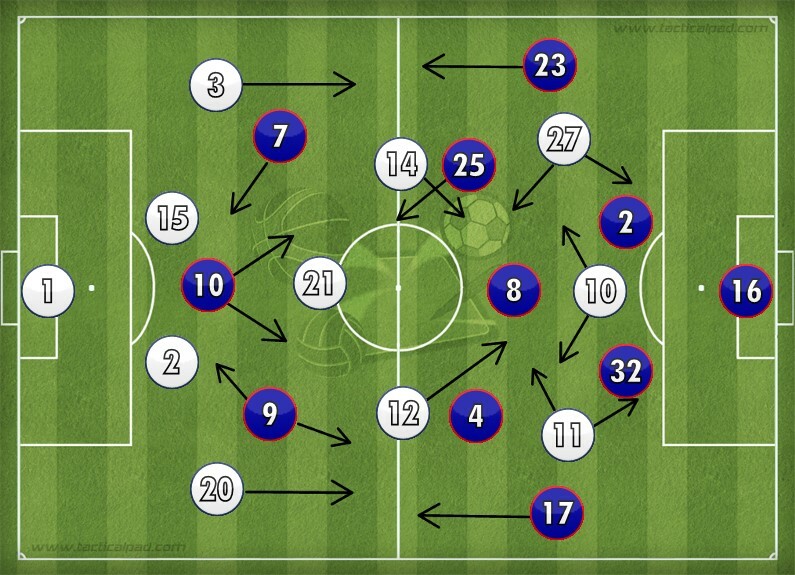 Eric Devin writes a detailed tactical analysis about the Champions League match that ended Lyon 2-1 PSG. Missing Samuel Umtiti, Clement Grenier and Christophe Jallet due to suspension and Mathieu Valbuena and Corentin Tolisso to injury, Paris Saint-Germain’s maiden visit to the Stade des Lumieres had all the makings of a nightmare scenario for hosts Olympique Lyonnais, especially given the clubs’ four prior meetings this season. Once in the league, once in the cup, once in the league cup and once in the Trophee des Champions, France’s version of the Community Shield, Lyon and the champions had met, and each time, the outcome was decisive. 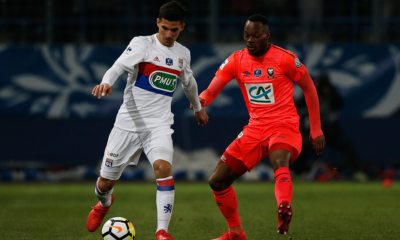 Lyon, despite a creditable performance in the Coupe de France had never looked close to having a handle on the champions, and on a weekend where most contenders for the league’s European positions had stumbled, for Lyon to improve their situation seemed unlikely. 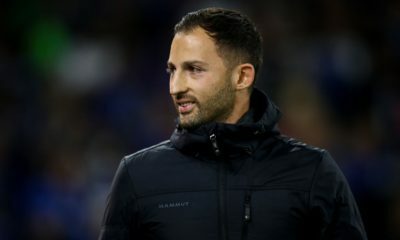 His options limited due to the above-mentioned absences, Lyon manager Bruno Genesio set out his stall with his preferred 4-3-3, left-back Jeremy Morel moving to center-back, a position he had played on occasion last season at Marseille. Henri Bedimo took the diminutive Frenchman’s spot at left-back, and Rafael replaced the suspended Jallet at right back. Midfield picked itself as well, with Sergi Darder once again starting in place of the injured Tolisso. 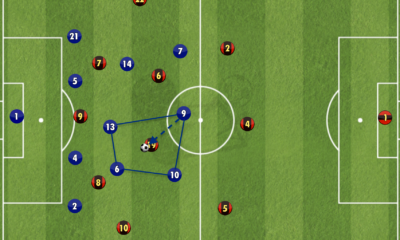 In attack, Maxwell Cornet started on the left, with Rachid Ghezzal on the right, flanking Alexandre Lacazette as inverted wingers. Paris Saint-Germain weren’t at their best, either, however, with Marco Verratti and Angel Di Maria both absent through injury, Serge Aurier suspended and Blaise Matuidi and Javier Pastore starting on the bench, the Argentine having battled injuries for most of the campaign. As impressive as Laurent Blanc’s charges had been to this point in the season, their lack of depth was perhaps now beginning to show. 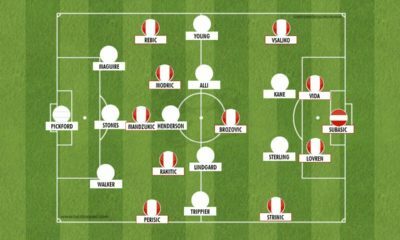 With Matuidi’s directness, Verratti’s tireless energy and Di Maria’s inventiveness all absent, the Champions were always going to struggle in creative terms, the likes of Rabiot and Stambouli not being exactly noted for their attacking capabilities. It would, of course, be all too easy to lay the blame for this result at the feet of Blanc for picking such a stodgy midfield, especially as Pastore showed no signs of rust upon entering in the second half. That said, the energy and pressing of Lyon were what made the difference on the evening, particularly in the first half. 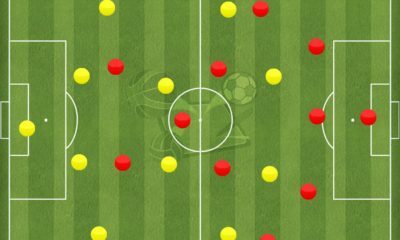 The above image may be a bit of an exaggeration, but in the absence of creativity from midfield, PSG were forced to turn to their fullbacks to be attacking outlets. 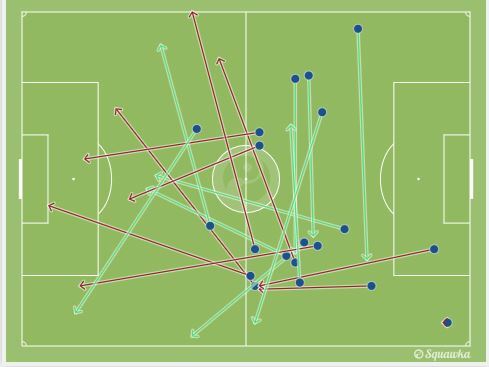 This is not necessarily a bad strategy, given how little the midfield was contributing in attack, but the tactic often left ‘keeper Kevin Trapp and the center backs, Thiago Silva and David Luiz isolated as Maxwell and van der Wiel raced upfield to be attacking conduits. 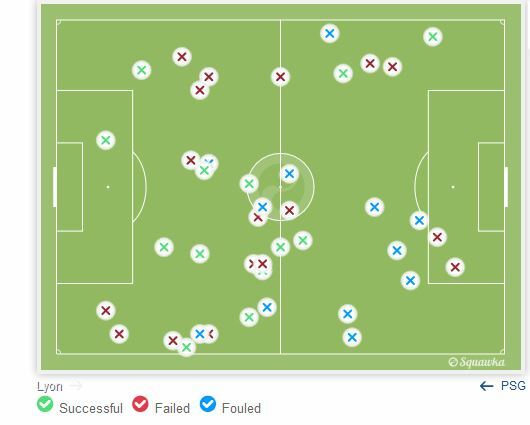 Both Silva and Luiz are also capable of doing a job in midfield and are decent passers, but nevertheless, under Lyon’s pressure, they wilted. Usually the long balls provided by the duo are integral to PSG’s style of play, as they offer an easy outlet for the likes of Di Maria and Lucas to run onto, but, denied the time on the ball to which they are accustomed, the pair too often ceded possession easily, failing to generate much in the way of significant opportunities. 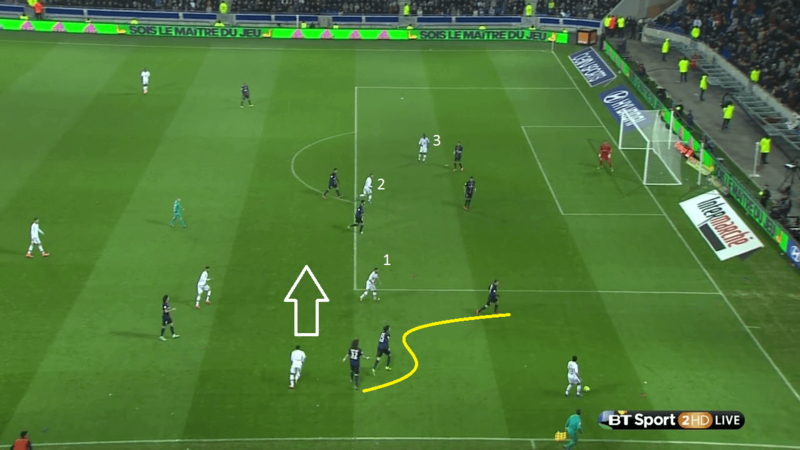 Not only did the attempts of the PSG full backs to get forward leave their fellow defenders isolated and ineffective in this manner, they were also frequently caught upfield, and more clinical finishing by Lyon could’ve resulted in a more emphatic scoreline as a result of this. This above image works nicely to show the knock-on effect created by the pair’s movement. Here, van der Wiel, the right back (in yellow circle), has tried to get forward quickly to aid in the attack. However, a long ball over the top has not reached its intended destination, and Lyon center back Yanga-Mbiwa, with the ball, is preparing to launch a counterattack by spreading play to Maxwell Cornet, whose run is anticipated by the white arrow. 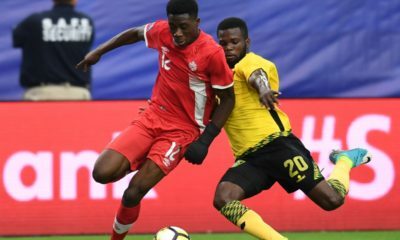 With the player supposedly marking him badly out of position, the young winger has acres of space into which to run, giving the hosts a potentially lethal attack. 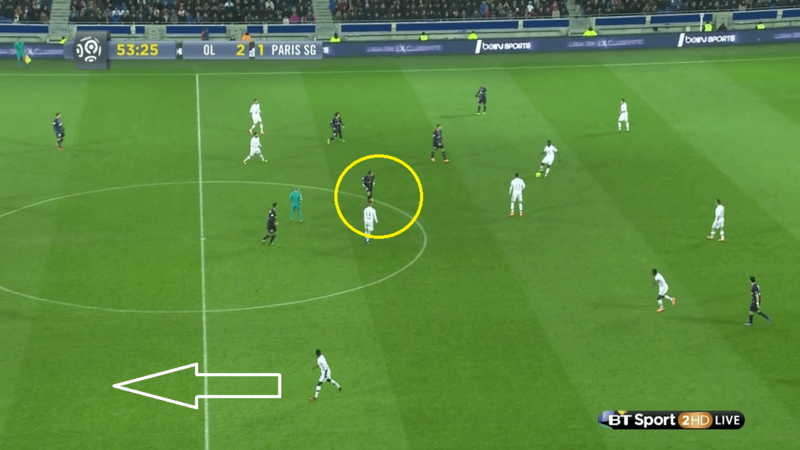 Due to the sometimes callow play of Ghezzal and Cornet, Lyon weren’t able to take full advantage of their opponents’ miscues, but the lack of positional discipline from van der Wiel in this example is truly shocking. Van der Wiel has always been a curious part of this PSG team, a player whose tenure with the club dates to the earliest period of Qatari investment. 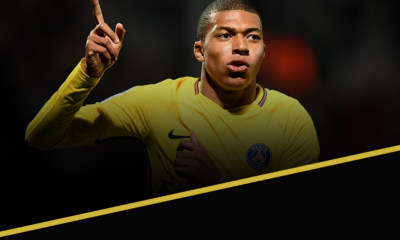 Never really a world-class player and always good for an instance of questionable judgment, that he is even still with the side has surprised many, given the club’s acquisition of Serge Aurier and a string of fine performances by Marquinhos at right back last season. 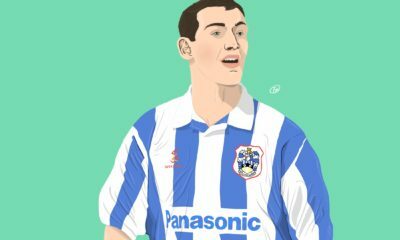 Thus, for the Dutchman to be suspect was no surprise, and his positional awareness on the night was lacking, a poor showing made worse by his error leading to Lyon’s opener. However, on the opposite flank, the more experienced Maxwell was also having a torrid time. Here, the Brazilian has lost the ball to Jordan Ferri, who was at his combative best in harrying the opponents’ back four. Cornet, having switched flanks with Ghezzal (a bit more on that in a moment) races away as Lacazette and the Algerian head for the penalty area to await a cross. Given that Cornet is left-footed, a cross wasn’t in the offing here, but with Maxwell well beaten, the former Metz man also has the option of cutting inside and shooting. Cornet having demonstrated his ability in this regard in fine form some two weeks prior against Caen, the need for a more cautious approach from Paris Saint-Germain’s full back is once again underscored, a worrying development given the abilities of Chelsea’s wide players in comparison to Lyon’s. As much as the pace and pressing of Lyon’s front three undid PSG’s back line, so too did their movement. In their starting roles, Cornet and Ghezzal both function as natural wingers, but with Lacazette hardly a target man at a wiry 5′ 9″, both were always going to switch flanks to add a further wrinkle to the attack. With the slow-footed Cavani doing his best when this happened, little generally came of Cornet’s movement, although the big Uruguyan cut a frustrated figure, eventually drawing a booking for persistent infringement, having fared little better than van der Wiel. Ghezzal, for his part, was also a nuisance, although he was a bit selfish at times in the final third. 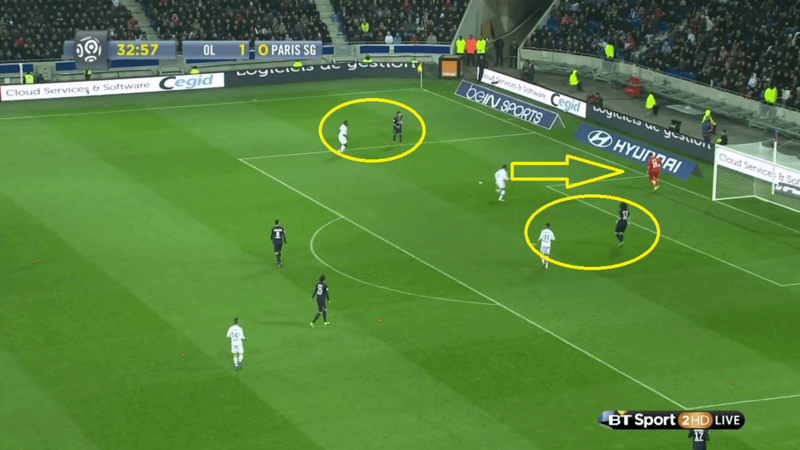 This freedom of movement for Lyon’s attack extended beyond the two wide players, however. 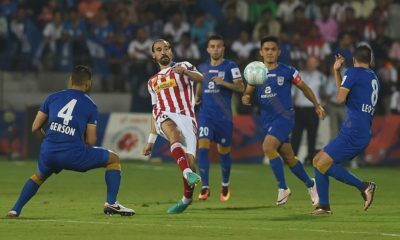 In the above image, Sergi Darder, the left-sided midfielder, runs with the ball, about to shoot. While it would be right to peg the Spaniard as being a bit selfish in this instance, given the space which Lacazette (1) and Cornet (2) can run into, that the opportunity has arisen at all is tribute to Lyon’s fluidity in attack. With the nominal center forward (Lacazette) drifting wide and Cornet cutting inside, the defense is at a loss in terms of tracking their men, Luiz’s desparate movement towards Darder giving Cornet a clear path to goal. 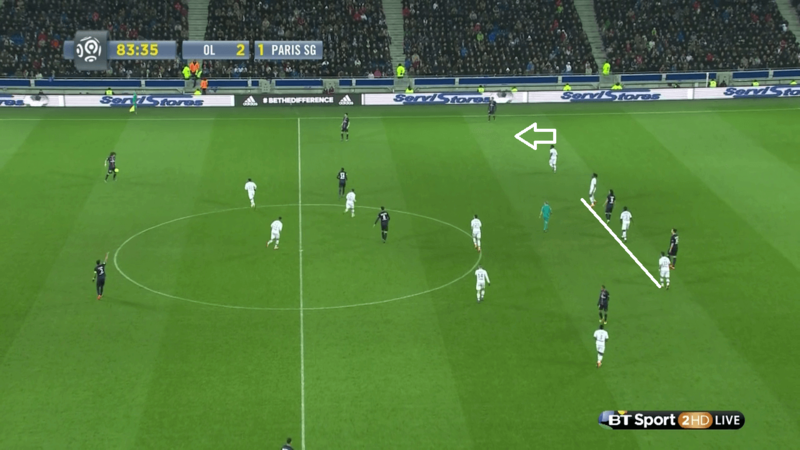 Further back, Maxime Gonalons serves as an option for re-starting the attack, with Ferri and Ghezzal covering for the run of Darder, denying PSG the chance to counter should he lose possession. 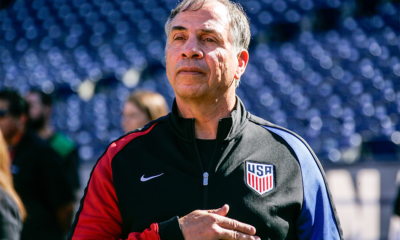 Thus, Lyon have not only sown confusion within the defense, they have also set themselves up well to deal with the consequences should the move break down. While that particular sequence didn’t result in a goal, it was more of this same movement that resulted in Lyon’s second goal. 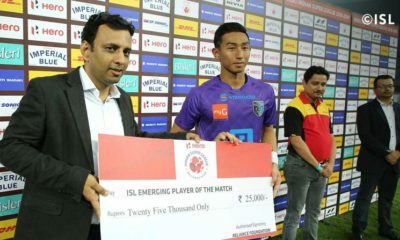 While the touch and finish from Darder to score the game-winner was truly sublime, how he was afforded the space to have such an opportunity deserves a closer look as well. In the first image, Lacazette stands on the near sideline with the ball at his feet, with David Luiz coming over to defend him as is his responsibility. Just behind the striker, though, Rafael prepares to make a run beyond him, indicated by the arrow. With Maxwell having stayed centrally to contend with Ferri and Cavani well behind the play, an ocean of space opens up for the former Manchester United player. A moment later, the consequences of Luiz’s being pulled out position are laid bare. Rafael has the ball and has plenty of time to deliver a cross, with three options at which to aim. Jordan Ferri (1) lurks at the near corner of the area, Darder (2) has started a run towards goal and Cornet (3) is at the back post. Lacazette, having completed the layoff is also moving back towards the center of the pitch, in the direction of the arrow, readying himself for a potential half-clearance to be volleyed goal-ward. Now, none of the first trio are anything resembling an aerial threat, but for all of Thiago Silva’s gifts in terms of making clearances, to contend with three potential targets is simply too much to ask, and the Brazilian was summarily caught in two minds, allowing Darder the opportunity to touch the ball over him and slot home, the former Malaga man’s skill greatly aided by the movement of his teammates. While things improved for the visitors in attack with the introduction of Javier Pastore at the interval, the Argentine’s determination leading to a fine strike from Lucas, Lyon also showed a remarkable ability to adapt when called upon. 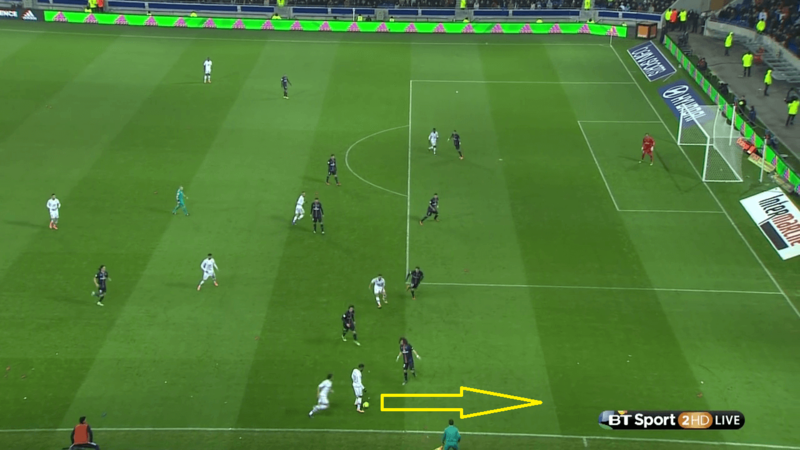 Pastore’s arrival finally gave the Champions a player on the pitch who could hold up the ball and keep possession for a longer spell, allowing his teammates better opportunities to join the attack. With Cavani now shifted to the right and Lucas on the left, Pastore and the goal-scorer gave PSG’s attack a more natural balance. 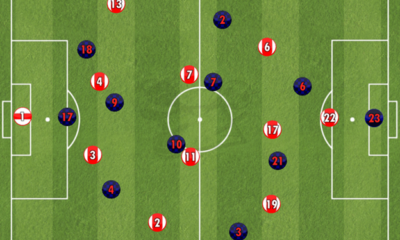 That said, Lyon showed a great amount of discipline even against a more potentially lethal attack. Here, ten minutes from time and with youngster Olivier Kemen having replaced Rafael at right back, Lyon are attacking PSG in their own half, but doing so in a very compact manner. All of the outfield players save Lacazette are in the frame, Ferri and Ghezzal aiding the young substitute in combating Pastore. 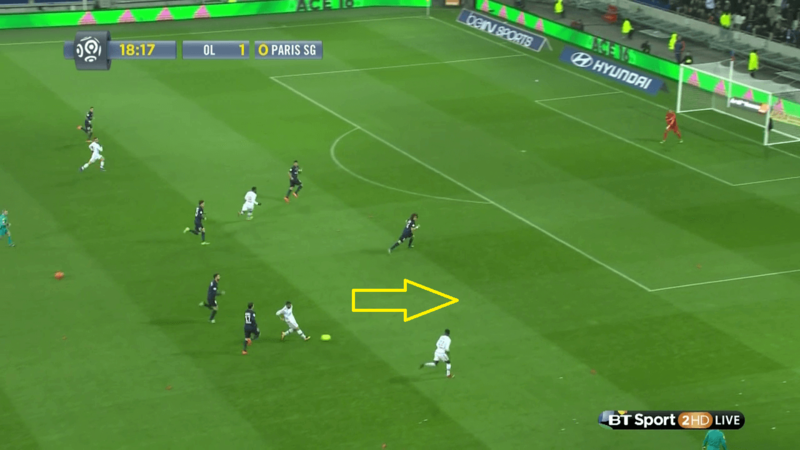 In the center of the pitch, Lyon’s two center backs hold a line some twenty yards from goal, Ibrahimovic trying to play off the shoulder of Morel, while Lucas sits behind the big Swede and Cavani. 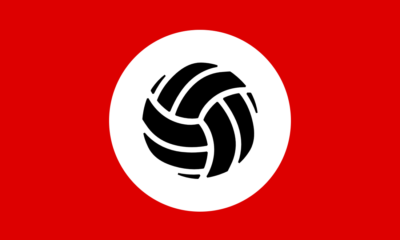 It is hard to fault PSG for trying to provide two natural target men in this regard, but by playing so narrowly, the two have also made Lyon’s job a bit easier, as Yanga-Mbiwa and Morel can not only communicate more easily but can also rely upon additional support from midfield and their full-backs, as Henri Bedimo shows by sticking close to Ibrahimovic. Wanting to be certain of three points, Genesio then introduced yet another wrinkle to Lyon’s defense, sending on Bakary Kone for Cornet. 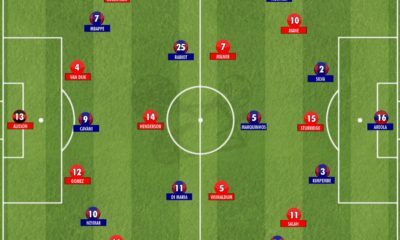 One would expect Jeremy Morel to simply move to left back, Bedimo replacing Cornet further up the pitch in this instance, but rather than that, Lyon actually morphed into a 3-5-2, with the three center backs sticking close to Cavani and Ibrahimovic to better aid in contending with the pair’s aerial abilities. 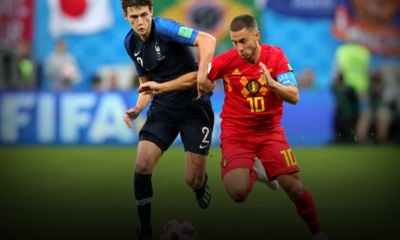 Displaying good organization as well as physical fortitude, the trick worked to a tee, frustrating the strikers and leaving the visitors thoroughly demoralized, Blaise Matuidi’s cameo unable to spark life into their hopes of pulling out a draw. 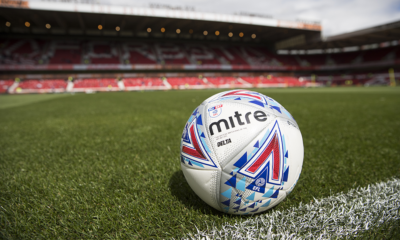 A wholly unexpected result, the win has allowed Lyon to move into third place, but more than that, it has demonstrated that the team, even when lacking key personnel, can still be a force with which to be reckoned. 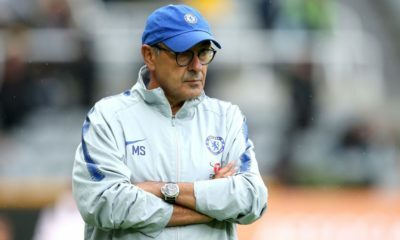 By pressing from the front and allowing his attackers freedom of movement, Genesio has continued fine-tuning his 4-3-3, and it now appears to be reaching its potential. 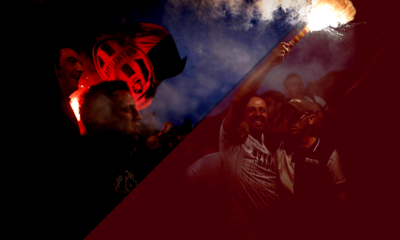 Better finishing and decision-making in the final third could yet see it find another level, but for now, fans of not only Lyon but of French football as a whole should embrace the manager’s creativity and boldness not only for the result but as a mark of the league’s quality beyond the Champions.